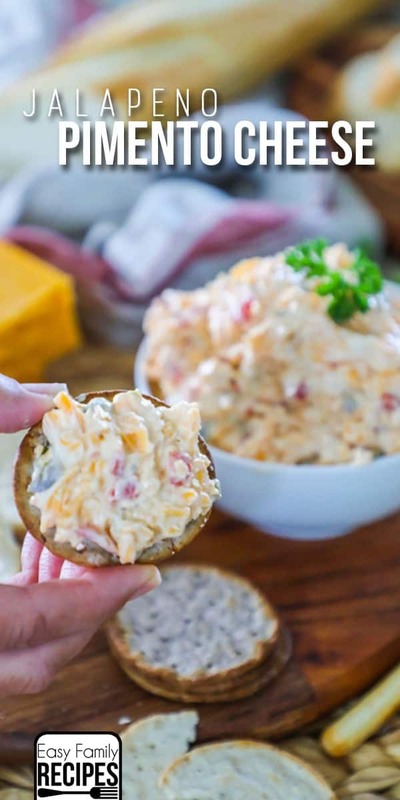 This homemade Spicy Pimento Cheese is perfect as a dip, on a sandwich, with crackers or to add to almost anything. It is full of flavor with just enough kick to make it fun. This fun twist on a southern delicacy is HIGHLY ADDICTIVE! I still remember being a kid and watching my dad eat pimento cheese out of a little plastic container. I thought there couldn’t possibly be anything grosser than neon orange cheese out of a tub. It just wasn’t right. It just didn’t look natural. And here I am today telling you this is quite possibly my favorite snack ever. I had a major turning point when we lived in South Carolina. I met a friend for lunch at this little spot in Columbia called DiPratos. If you are in Columbia, you HAVE to go there. It is so good.. so so so good! But back to the story… One of my most foodie friends took me here and said we have to order the pimento cheese. I am sitting here thinking, “I don’t eat that stuff. What the heck is she thinking?” This was not the kind of friend I expected to eat neon orange cheese. But my trust ran deep, I took her word, and learned there is a significant difference between mass produced, neon orange pimento cheese and homemade pimento cheese. We can just say that moment was a turning point for the rest of my snacking life! At Dipratos they serve homemade pimento cheese with these fresh, hot, irresistible pita chips. Seriously heaven people. Once we left South Carolina, I had a serious hole in my life and so I had to go on a mission to create my own recipe so that I could still indulge in my favorite snack. Through a bit of trial and error and about 50 pounds of cheese I finally came up with a recipe that I love. And in the process, I found out that even though, I thought that it really couldn’t get any better than DiPratos, I actually like it even more with a kick. Spicy Pimento Cheese is quite possibly the most addictive thing that enters our fridge. Part of the issue I had when I thought that pimento cheese spread was so weird is that I didn’t understand what it was. One of the key ingredients is obviously pimentos. So what the heck is a pimento? Pimentos sound a little funny, but really they are just a small, round-ish, bright red, sweet pepper. They are not at all spicy, but have a really mild, sweet flavor, somewhat similar to a roasted red pepper. 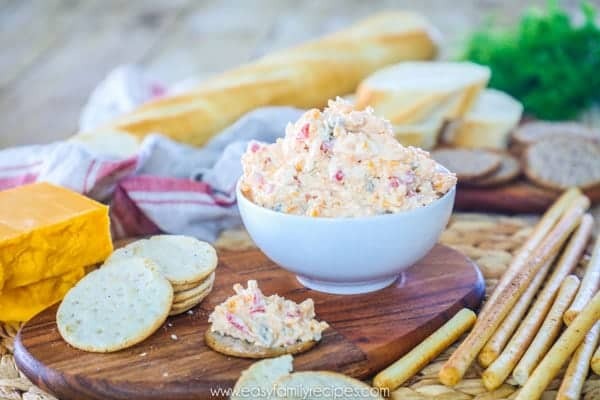 The bright red color is what gives pimento cheese it’s signature “neon orange” color. 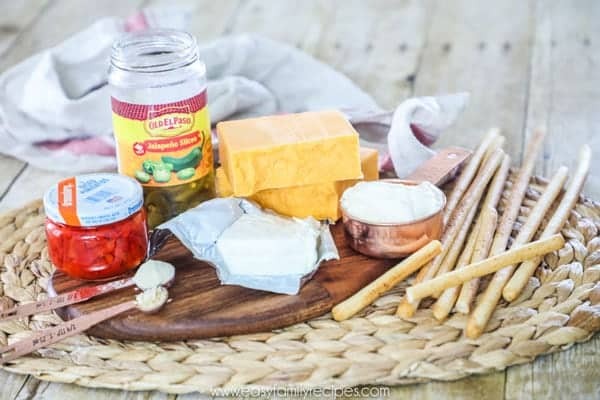 I have seen a variety of regional brands as I have lived in many places, but also Goya has a line of pimentos, and most stores have a section of Goya foods in the specialty or international section. You can usually find jarred pimentos diced, which is really convenient, and also sometimes whole. 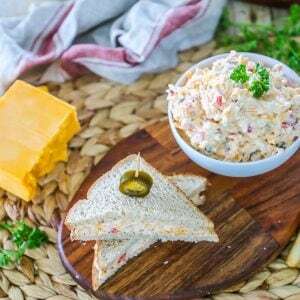 For making homemade spicy pimento cheese diced is the easiest but either variety will work. Those are some of my favorites but the possibilities are really endless. I even just put some on a grilled chicken breast or scrambled eggs. 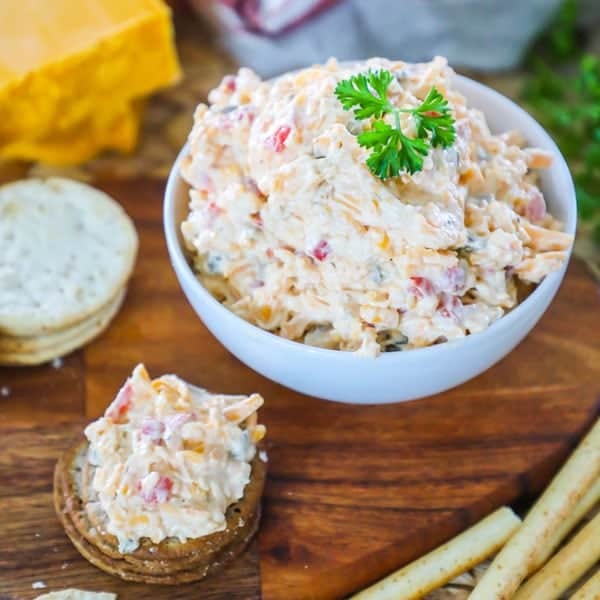 This spicy pimento cheese really does make everything better! 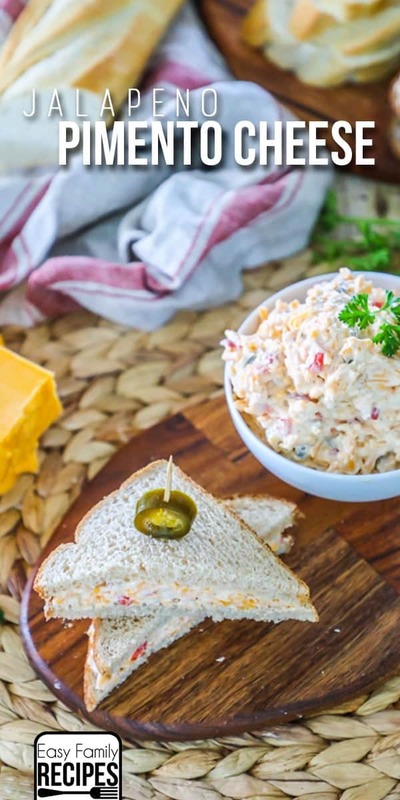 Classic southern pimento cheese has a few main ingredients: cheddar cheese, cream cheese, mayonnaise, and of course, pimentos. Combined with spices, this makes the magic happen. 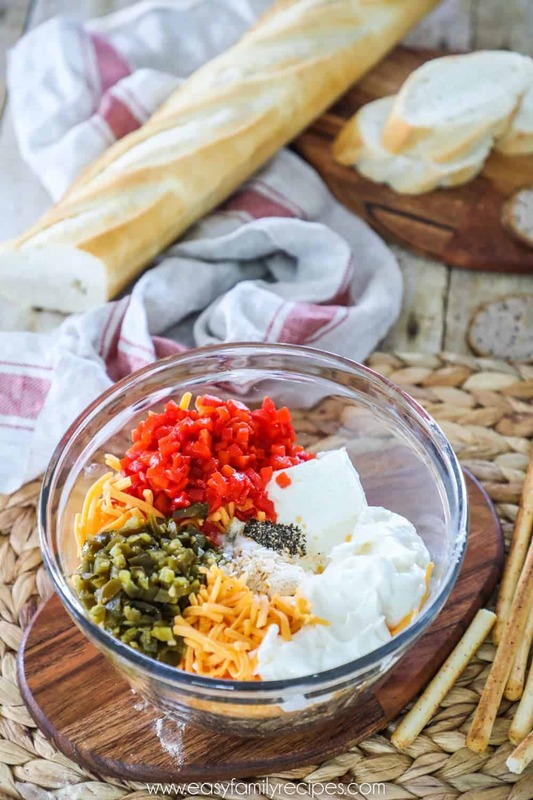 I am going to walk through the recipe below, step by step, talking through the ingredients and tips and tricks along the way. If you want the quick version, feel free to scroll down to the recipe card at the bottom of the post. 16 oz sharp cheddar cheese, grated- You can use freshly grated or pre-grated cheese. I think it is really important to get sharp cheddar since it is such an important part of the flavor of the finished cheese spread. 8 oz Philadelphia cream cheese, softened- This is one brick. You can use regular or light if you want to save a few calories. Avoid fat free because it doesn’t blend the same. 1/2 cup mayonnaise- Get the real stuff! There is a time and place for light or Miracle Whip, but this isn’t it! 4 oz chopped pimentos, drained- See my notes above on where to find these in the grocery store. I prefer to buy them pre-chopped but if you can only find whole then you can either chop by hand or use an electric chopper or food processor to chop them up a bit. 4 oz jarred jalapeños, drained and chopped- These should be either by the pickles or in the mexican food section (or both!) The jarred jalapeños will most likely be sliced and not diced, so as with the pimentos, just use a knife or electric chopper to chop them up. This doesn’t have to be exact on the mixing. What is important is not the time, but the use of the electric mixer. You can do this by hand, but I really like how the electric mixer (either a hand mixer or a stand mixer) really helps to break up the shredded cheese a bit and combine it into the creamy textures. Serve as a dip with crackers or chips, as a sandwich, as a topping, or on veggies. 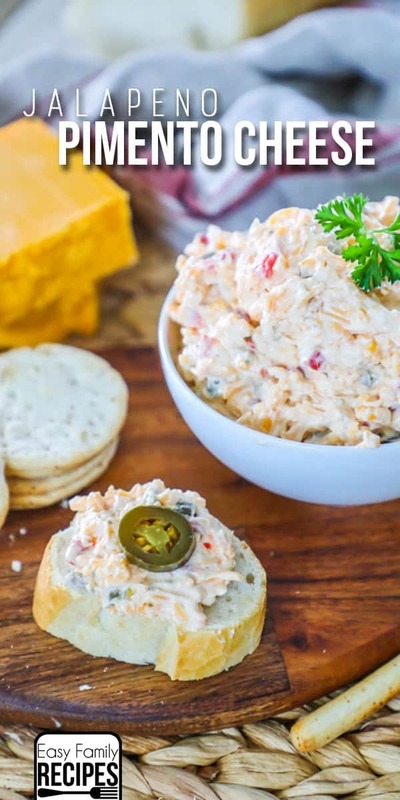 I hope you love this Jalapeno Pimento Cheese recipe as much as we do! If you get to make it, I would love to hear about it in the comments. Or snap a pic of your creation and tag me on Instagram @easyfamilyrecipes. It makes my day to know others enjoy my recipes as much as we do! 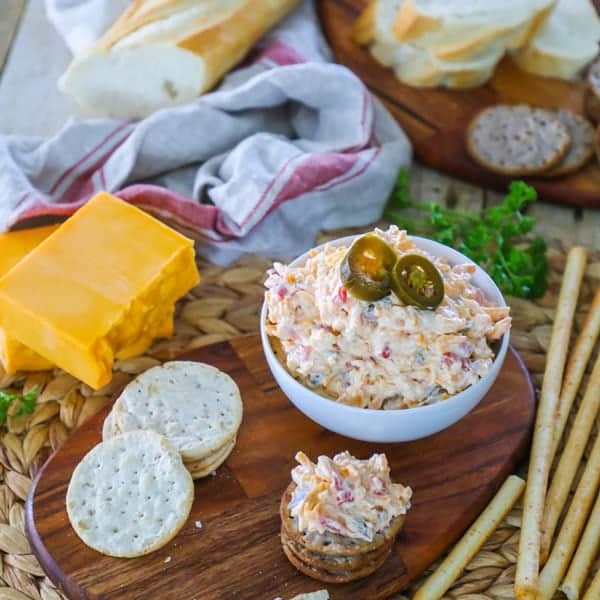 This homemade Spicy Pimento Cheese is a version of the southern classic with a little kick thanks to the addition of jalapeno peppers. 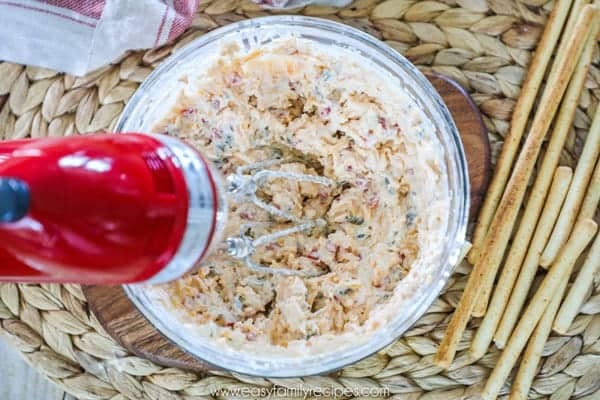 This pimento cheese spread is rich, creamy and highly addictive! Nutrition information is an estimation. I recommend you calculate the information based on the brands and products you actually use for the most accurate nutrition. I usually add skittle extra kick to mine (Louisiana)!!! How many sandwiches will this recipe make? Not lose the recipe! Thank you!